On no say it isn’t so! I can’t believe it but my boy Jackaroo turns 9 years old tomorrow. Seems like yesterday he came to us as a bouncing baby boy and I do mean bouncing, he was fat! We will save the birthday celebration until tomorrow but I am feeling especially sad about him aging as I found out on Monday he has Spondylolysis of the spine and arthritis in his shoulders and elbows. Of course Jack does everything as though he may never get to do it again so he gives it his all. Some of this is normal wear and tear so I was not too surprised but the spine problem is disconcerting. The ortho-vet we saw said he can continue to train and run agility and that it actually will be good for him. But eventually his spine will be too stiff to jump anymore so until then I will keep him going. He will be getting chiropractic care, ultra-sound treatments and massage. Good thing we have pet insurance. He did manage to charm everyone at the vet office as usual. He tries to divert their attention from probing, x-raying and massaging with kisses and soulful brown-eyed stares. I swear if he could bat his eyelashes he would. By the time we left he had been petted, fed and hugged by all the staff. 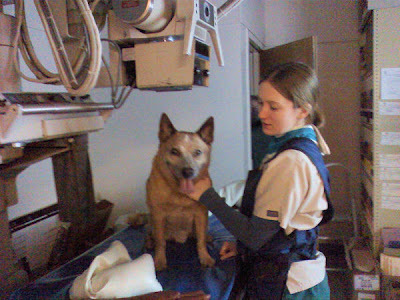 Here he is with the x-ray tech, she really loved him and he loved her since she fed him incessantly. I took this with my new phone camera and I am still learning to use it so excuse the poor photo. But, isn’t he cute?! I hope you will come tomorrow and wish him a Happy Birthday. Cam thanks for visiting, it looks like we may be neighbors of sorts.